Wendy B. Lawrence has been selected as the recipient of the 2016 Kenneth W. Porter Award in recognition of her many contributions to the education of K-12 students by showing them about the exciting opportunities in STEM fields. 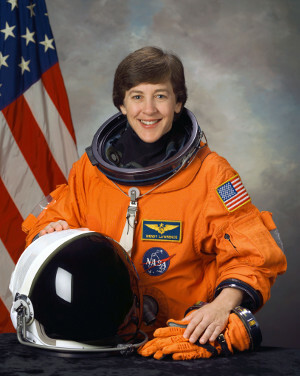 A graduate of the United States Naval Academy, she served as a Navy helicopter pilot before being selected as an astronaut and working with the National Aeronautics and Space Administration (NASA) for 14 years. A veteran of four shuttle missions, she has logged over 50 days in space. As a speaker, educator, and advocate for scientific research and education, she has been very active in working with K-12 students to educate them about careers in STEM fields and the great opportunities in space exploration. She currently works part-time at the Space Camp and the Kennedy Space Center Visitor Complex informing the public about NASA’s spaceflight programs and participating in STEM educational programs. She has a long history of involvement with the Sally Ride Science Festivals as a champion for girls learning about science and entering STEM fields. Through her affiliation with the Ride Family Foundation, she attends events across the United States talking with students, teachers, and industry leaders about the importance of STEM education. She was the catalyst for bringing the Sally Ride program to the University of Washington Bothell in 2014 attracting more than 900 middle school students to experience interactive exhibits, hands-on workshops, and inspiring standing-room-only talks. She is the founder of an organization dedicated to exciting young people about space and STEM education: The MARS generation. Her community involvement also includes the Washington Aerospace Scholars Program, the Vista Middle School Girls Robotics Club, and the Ferndale Library Robotics Club. Her outreach endeavors extend well beyond professional affiliations to community and K-12 educational programming.